For women who are not on the pill, it is possible to delay a period with a three times a day pill called Norethisterone. Many women are keen to delay a period to avoid having it at an inconvenient time such as a holiday or other special event. For women who are already taking a contraceptive pill, they can start their next pack without a break and this will avoid them having their period. It is not recommended that this is done for more than three consecutive cycles. Can I Buy a Pill to Delay my Period? The answer is yes! The Online Clinic is happy to prescribe Norethisterone for women who want to delay their period but who are not on the contraceptive pill. 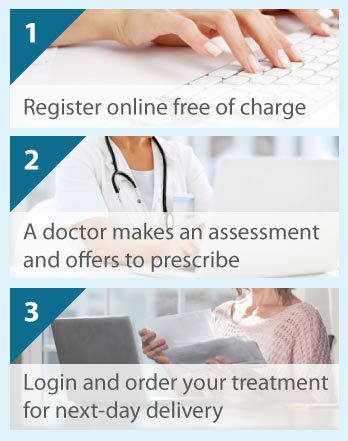 Click on the free consultation icon to begin. If you are not taking the contraceptive pill, to delay your period you will need to take 5 mg of Norethisterone three times a day, commencing 3 days before your period is due. After you stop taking Norethisterone you will have your period within 2 - 3 days. Are there Side Effects with Norethisterone? Side effects are very rare with Norethisterone if it is taken as directed. It is very important that you disclose all relevant information to our doctors by answering our questions truthfully; this will ensure that the medication is not given to someone for whom it is not appropriate.